Dealing with TMJ symptoms could prove to be quite overwhelming for patients because traditional dentists often recommend extensive procedures that span out for months and months. Aside from the fact that these are quite painful and stressful for the patient, they are also extremely expensive. Holistic dentistry, on the other hand, aims to help the patient find a far less invasive treatment plan that is focused on eliminating the major causing factors of the TMJ, but also on helping the body heal itself by making use of natural and completely non-invasive methods. To better understand why a holistic alternative to traditional TMJ treatments is required, let us tell you the most important things about the condition and how it is assessed. TMJ stands for Temporomandibular Joint Disorder, which is a condition that affects not only the joint in the jaw, but the facial muscles as well. It manifests with local pain in the jaw upon opening and closing the mouth, as well as muscle spasms. The pain can be of various levels of intensity, but the long-term discomfort caused by the condition can greatly affect the patient’s quality of life. This is actually the most common factor leading to TMJ because this affects the temporomandibular joint directly. This is usually caused by malocclusion, which is the imperfect positioning of the teeth when the mouth is closed. This causes the jaw to shift to an unnatural position, which puts significant pressure on the jaw joints and the muscles of the face. Bruxism is extremely damaging to the teeth because the grinding causes them to change shape. If the bruxism is allowed to continue over a long period of time, the teeth can become deformed enough to lead to malocclusion and therefore, to TMJ. If the patient suffers from disorders of the joints, the temporomandibular joint might also become affected over time, thus leading to TMJ. Developing habits that include chewing for a long period of time could strain your temporomandibular joint enough to lead to TMJ. Chewing gum is by far the most common example of such a habit. If eating a piece of gum every once in a while could actually be good for your teeth, going through two packs a day might cause some long-term issues. Among the many negative aspects brought on by stress is clenching of the teeth for long periods of time. This could lead to TMJ over time due to the fact that it puts pressure on the teeth, the jaw, along with the joints and on the muscles as well. Jaw pain when opening and closing the mouth. 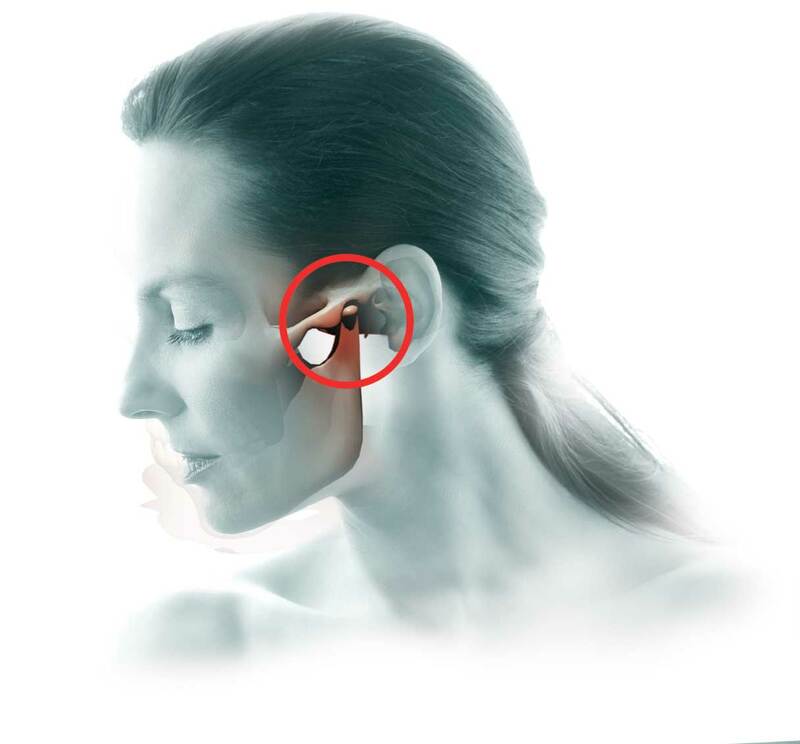 The clicking or popping of the temporomandibular joint when opened or closed. Local pain in the jaw joint area that extends to the muscles of the face. Difficulty opening and/or closing the mouth. Pain in the shoulder area. The intensity of the pain also depends on the gravity of the causing factors. In more advanced cases, the articular disc could be dislocated, thus causing the bony structures in the joint to rub one onto the other, thus causing the patient severe pain. In order to establish the course of treatment for the TMJ, the patient needs to be thoroughly examined. The key focus points of the examination need to be the temporomandibular joint and the teeth. According to the degree to which these are affected, the doctor will choose the appropriate treatment plan. The temporomandibular joint might require anything from a short course of anti-inflammatory medicine to reparatory surgical procedures. As for the segment of the treatment that refers to the teeth, its objective needs to be to correct the malocclusion. In the event that the teeth are heavily affected, and the patient presents significant malocclusion, the first line of treatment usually entails that the patient wears a protective bite splint to enable his muscles to relax. The splint is custom-made for the patient’s teeth and it is used to create a satisfactory closing of the mouth. Then, the dentist will work with the patient so as to level the teeth and correct the malocclusion permanently. This is performed by applying crowns to all of the affected teeth so as to enable the correct closing of the mouth. The holistic approach to treating TMJ differs significantly from the traditional one because it is meant to help the body of the patient as a whole. Advanced issues are generally treated by employing the same classic measures. The treatment plan is established by the holistic dentist according to the specific symptoms displayed by the patient. The doctor will have to decide which of these can be resolved by employing standard procedures and which can be improved by natural methods. However, it is crucial that the patient understands how this will improve his condition, how that section of the treatment will contribute to his journey of fighting TMJ and getting better. Aside from removing the major causing factors, the holistic dentist will also focus on helping the patient eliminate all the smaller predisposing factors. Treating TMJ naturally begins with the food consumed by the patient. Firstly, the consistency of the food is extremely important. All hard foods need to be eliminated from his diet and replaced with softer alternatives. This will actively help the patient become confident while eating again because chewing his food will no longer cause him spontaneous pain outbursts. In turn, this will reduce the stress endured by the patient day by day. Secondly, the holistic dentist will develop a special diet for the patient that includes food that can support his joints, his muscles, and his teeth. This diet is actually intended as a long-term plan for the patient, so it is extremely important that it includes the right food to support his problem areas. The patient will have to perform two very different types of exercises. On one hand, the holistic dentist will present him with a set of special TMJ exercises meant to strengthen his muscles and his temporomandibular joints. The doctor will choose these exercises according to the specific issues that the patient presents. It is crucial that the exercises do not overwork the jaw because this could cause more damage and actually make the TMJ worse. The holistic dentist will choose the ideal exercises for the patient and will support him through every step of the way. In the event that the patient feels that some of them are too difficult for him and cause him pain, the doctor will find an easier alternative. Once the correct exercises are identified, the patient will have to perform them periodically for a long period of time. On the other hand, the patient will be advised to do exercise daily. It is advisable that the patient opts for sports that do not strain his jaw excessively. This is why the holistic dentist will help him make the right choice. Regular exercise will actually help the patient reduce his stress levels and improve his posture, this contributing to treating the TMJ naturally. The holistic dentist will advise the patient to take the time to meditate periodically. Whether he prefers to take a yoga class or whether he can only spend a few minutes every morning, including meditation into his daily routine will do wonders. Moreover, the patient will be advised to meditate on the progress of his TMJ treatment. Visualizing the cumulative effect of each step of the treatment and how he is getting better and better every day will give him the strength and confidence to continue with the plan. This type of therapy can do wonders for TMJ patients. It is administered as a massage that can get the patient into a deep state of relaxation. The aim of the therapy is to enable the skull, the neck, and the spine to return to the correct position. It is a non-invasive procedure, which makes it ideal for patients suffering from advanced TMJ. Sessions are usually one hour long and the patient can actually include part of the meditation in them as they enable the patient to release stress. This makes them the perfect time to contemplate the progress of the treatment plan because after the session, the pain that the patient might have felt before will be improved significantly or it will even disappear completely. Treating TMJ symptoms requires patience because the plan will be spanned over a long period of time. The holistic approach to treating this condition can help the patient view this period not as a simple treatment, but as a journey to a healthier and stronger version of themselves.